Magnetic White Vinyl 620mm wide suitable for vehicle graphics and tested to national speed limits. Please note vehicle signs should always be placed on the side or back of the vehicle dependant on individual vehicle aerodynamics. The white vinyl is factory laminated at point of manufacture and runs edge to edge on the non magnetic side, which is digitally printable. The magnetic side has a UV coating to help protect the material in situ and aid handling. Please ask for a care and application leaflet that will help you care and look after the sign. 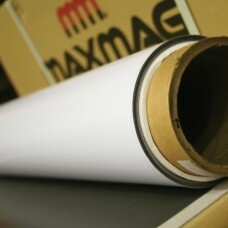 Magnetic White Vinyl 620mm wide suitable for vehicle graphics and tested to national speed limi..